The images I see when I perform a Google search for “Africa agriculture” are disconcerting. There is typically a smiling woman with a hoe doing backbreaking work. When I replace “Africa” with “America” in the Google search, the images returned show tractors, high-tech irrigation, and other machines. There isn’t a hoe in sight and certainly no one bent over in the fields. People do not willfully choose the ‘backbreaking’ path to earn a decent living when there are improved methods for doing the same work; and no one who farms with a hoe, does so with a smile. It is my hope that we can collectively change these images in the medium term. I would like for us to see and refer to the latter set of images when we speak of Africa’s future, whether it relates to agriculture or industry. The only way for us to realistically change this narrative is to invest exponentially in high quality education that hinges on science, technology, engineering, and math (STEM). The STEM fields cut across sectors and can drive transformation across entire value chains. They teach students how to think critically; how to be analytical; how to discover and create solutions to problems. We must therefore stop limiting African children to a narrow view of the world. We must stop teaching primary school students that “H stands for hoe or hut.” We must instead stimulate their creativity by exposing them to what is expansively possible through innovation. The images they see must change, as must the content of our regional and national curricula. One of the most compelling illustrations of this point is evidenced in the life story of William Kamkwamba – the boy who harnessed the wind. He was born into poverty in Malawi and was forced to drop out of high school when a drought wiped out his family’s agriculture earnings. They could not afford to pay the $80 annual school fees, so 14-year old William instead visited the village library to keep reading. The 8th grade American textbook, “Using Energy” changed his life forever. In it he saw the picture of a wind turbine and he was inspired to build his own version using scrap materials. He subsequently built a series of windmills to power light bulbs, charge phones, and pump water for irrigation in his village. I posit that there are numerous Williams across Africa whose creativity needs to be ignited. I’ll never forget my first visit to Barcelona in June 2010. I was speaking at a conference and squeezed in some time for an open-top bus tour of the city. We reached the downtown area where imposing architectural masterpieces left my group and I astonished. What was even more impressive was that much of the infrastructure was built in the early 1900s. It was all carefully planned and was built to last. The wheels in my head began spinning out of control. I thought of the African countries I had visited and wondered what went right in Barcelona. Through research, I discovered the Catalan urban planner, Ildefons Cerdà who designed Barcelona’s urbanization plan. In fact, he coined the term, “urbanization!” Cerdà meticulously studied and surveyed the social, public health, housing, and physical environment conditions in Barcelona, in addition to reviewing the topographic work done by his Parisian contemporary, Georges Haussmann. Driven by his vision to address the poor health and educational conditions in the city, he studied the problems, and developed a plan, which was successfully implemented. Cerdà exhibited transformative leadership; which was underpinned by technical expertise. And all this happened in 1859! My mind drifted again to Africa. The questions began circling. 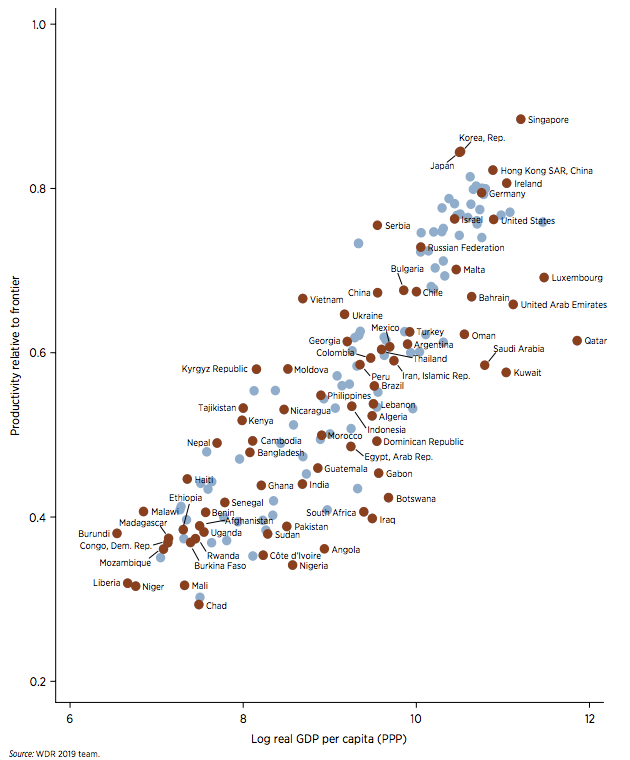 Why did a number of African countries and leaders fail to envision (and develop) more advanced versions of their countries? Why did they fail to lead their countries into industrialization? Although there are successes that should be celebrated—including declining poverty levels and rising incomes in some countries —my assertion is that the continent still requires a different type of visionary leadership to fully maximize her potential. When local, state, or federal governments boast about building infrastructure, we should expect a minimum standard of quality and operational excellence. Instead, we see many images of basic, rudimentary structures that are poorly constructed and that are effectively de-motivating. Furthermore, many of our university graduates are job seekers who cannot fill existing roles because of the mismatch in their technical and soft skills. In Nigeria, over 15 million children are not in school. Yet there is no state of emergency in education – the very sector upon which our human capital and future are hinged. Within our leadership, there is largely poverty in vision and aspiration. Barring a few countries, many decision-makers are not working to bring their nations into the fourth industrial revolution. They continue to see the hoe as the primary implement for progress. Perhaps a visit to Barcelona would precipitate the enlightenment of and socio-economic ambitions of those who make decisions in Africa. According to this graph, the next generation of African workers will not be productive, yet they will account for almost a quarter of the global workforce by 2050! 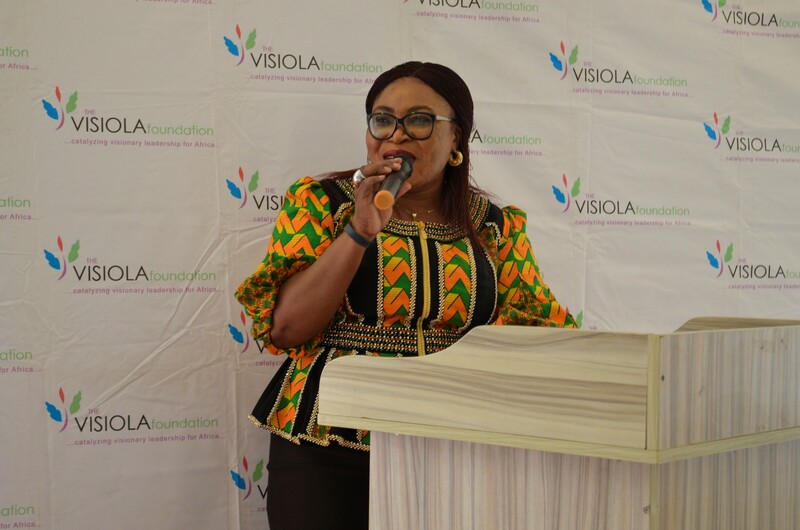 This is therefore an extremely urgent call for African countries to heighten their investments in human capital development; which is exactly the Visiola Foundation’s focus, coupled with crowding in women into the technical fields. Africa as a whole will not participate in the 4th industrial revolution, if it does not aggressively build its human capital, while growing the world’s largest population. We had an exciting third quarter. It is usually our busiest time of year, given our summer programs. 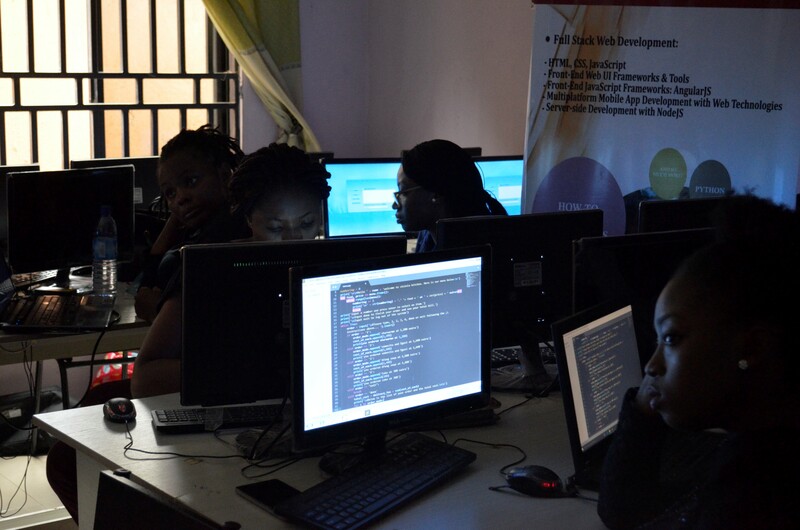 Our Coding Boot Camp for Girls trained young women in Enugu in various computer programming languages in a bid to expose them to better paying job opportunities. 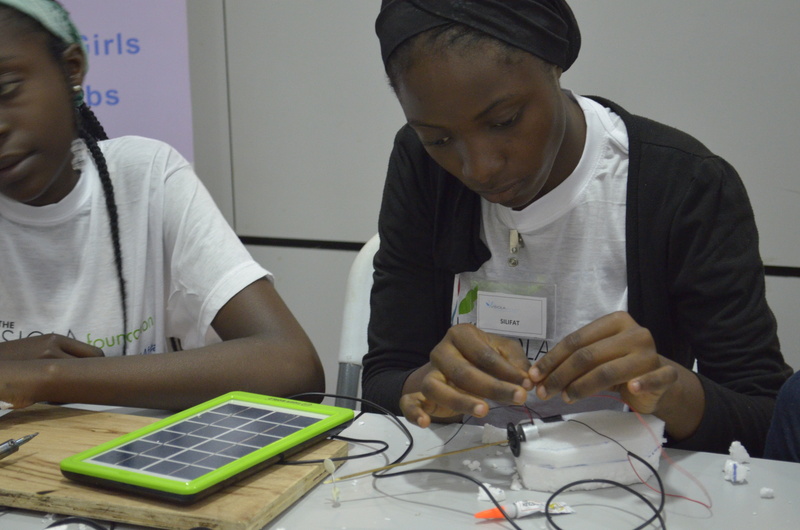 Our STEM Summer Camp mentored teenage girls from across Nigeria in Renewable Energy with a focus on solar power. Students designed and built creative projects; which they presented to a panel of judges including our partners, Schneider Electric West Africa and Young Engineers Nigeria. 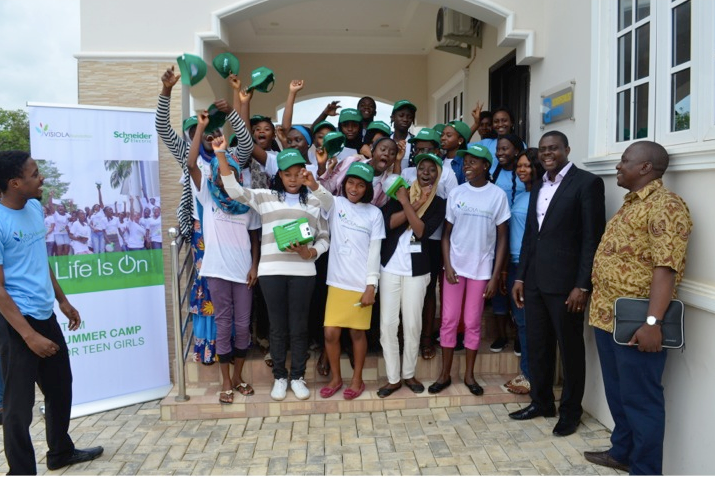 The winning team was rewarded with an all-expenses-paid Discovery Tour to Schneider Electric’s factory and office in Lagos. We hope you enjoy reading about our students’ activities during Q3. The Visiola Foundation’s Coding Boot Camps for Girls teach students from disadvantaged backgrounds how to code in various computer programming languages. 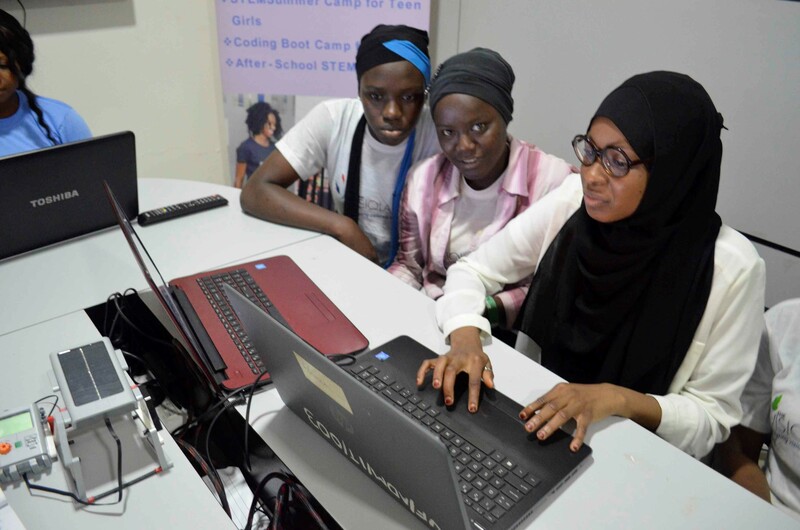 The students are introduced to the exciting field of Computer Science, given practical, hands-on activities to boost their understanding, and mentored to improve their self-confidence and public-speaking. The 2018 summer boot camp took place in Enugu on 16th July to 4th August. 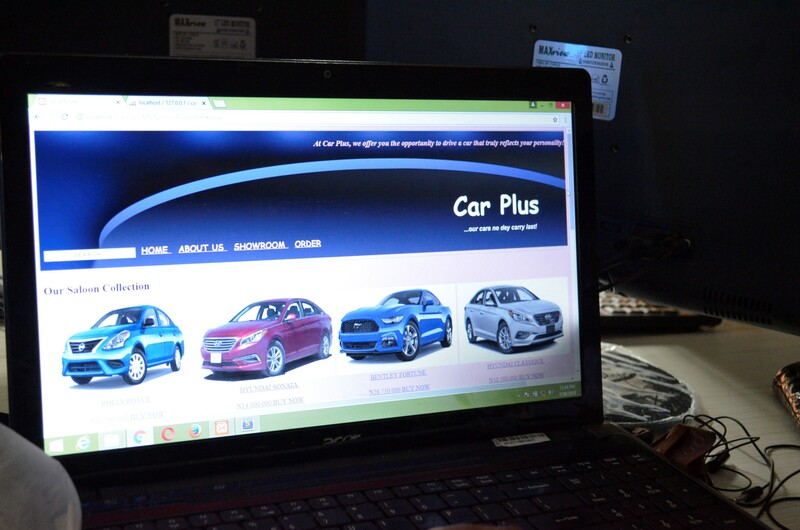 During the camp, students learnt Full Stack Web Development, Database Management, and Mobile App Development. Our aim was to provide them with a foundation upon which they will mature into successful software developers and IT professionals. The skills acquired by the students will increase their employability in our increasingly technology-dependent world. It will boost their self-esteem, while sharpening their critical thinking and problem-solving skills. The Coding Boot Camp creates an environment where risk is rewarded, curiosity is encouraged, and creativity is expected. 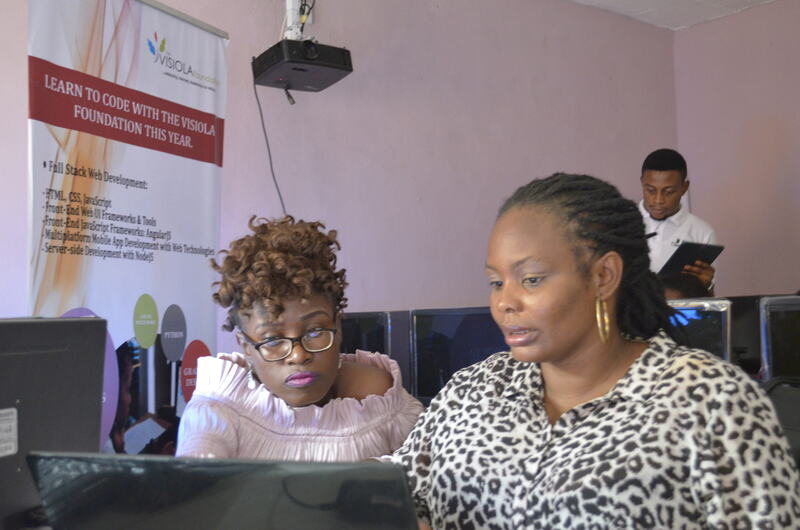 Participants were also exposed to successful professionals, Yetunde Sanni (Software Developer, Andela), and Elizabeth Kolade (Technical Specialist, Consultancy Support Services) who shared their personal experiences and helped the students better visualize the possibility of succeeding in a tech career. During the camp, students developed an app for restaurants to use in processing customers’ orders, a grade converter application for schools, and a car rental website. 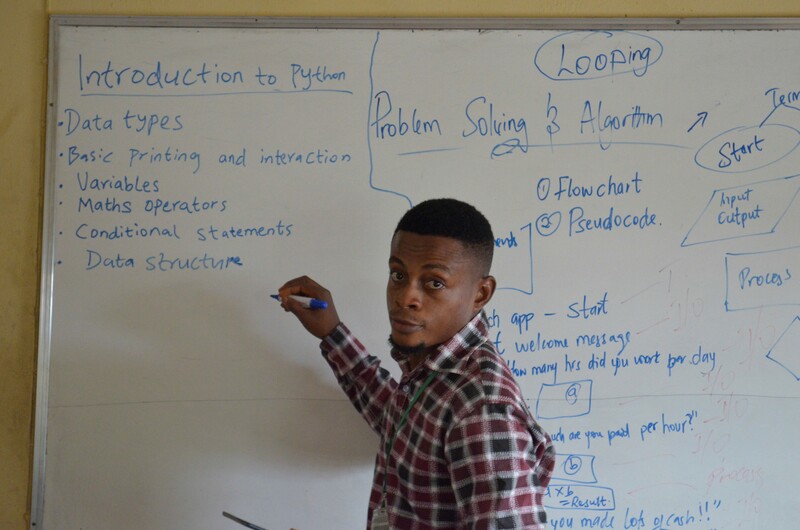 As part of their final projects, student teams designed an e-library book management system, a train ticket reservation system, and they built an application that assists junior secondary school students in learning mathematical concepts. The Coding Boot Camp ultimately helps the students become more successful, while inspiring them to take on the world’s greatest challenges. 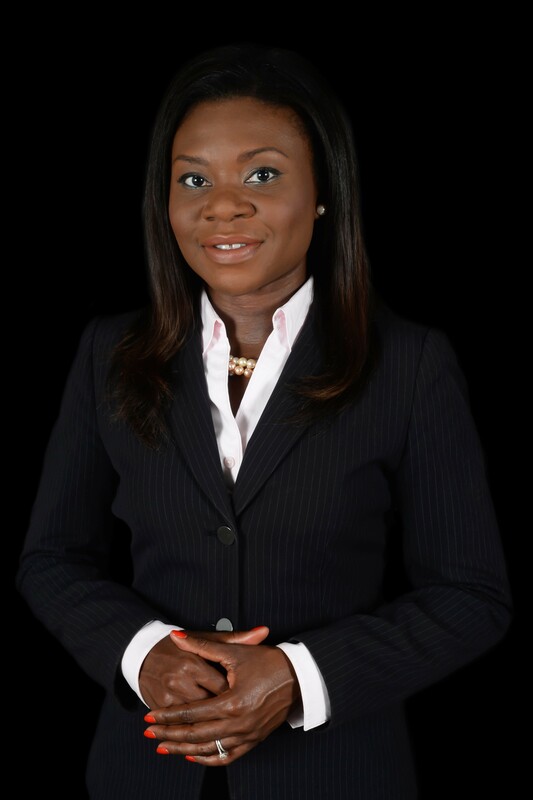 We seek to increase the number of women in Computer Science with a view to create a pipeline of professionals who will leverage technology in developing innovative solutions to Nigeria’s development opportunities. 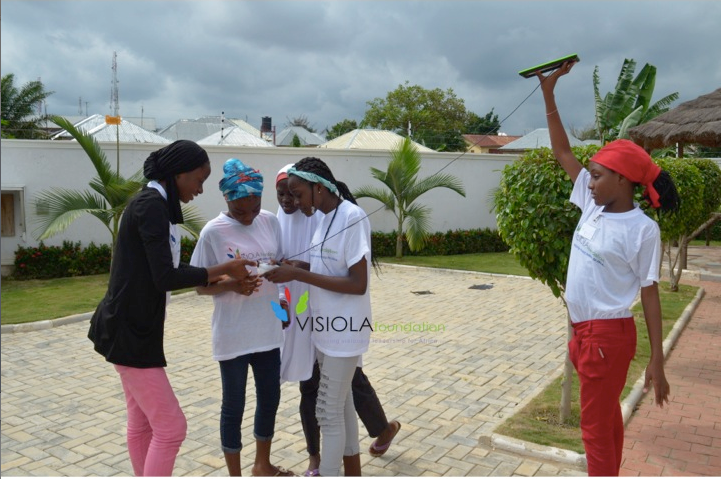 Our fourth STEM Summer Camp for Teenage Girls took place in Abuja on 11th to 18th August with support from Schneider Electric West Africa. 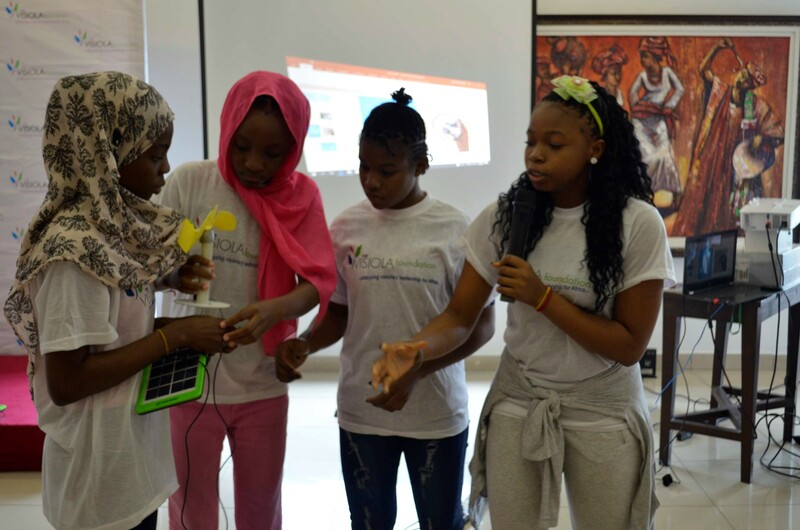 The theme for the 2018 summer camp was “Solar Power for Nigeria” and it exposed students to the diverse solar power options available, while helping them reflect on how to harness this potential for economic growth and development. 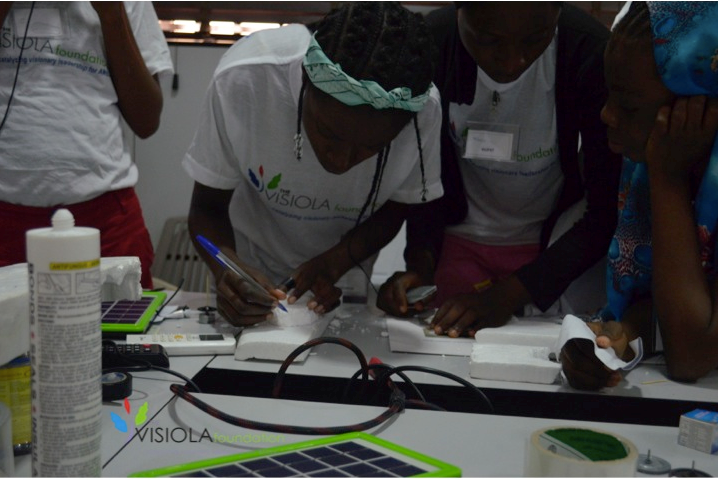 The students were taught the science behind solar energy and built demo projects to generate electricity. The camp started with many engaging activities. During the solar lab sessions, students were introduced to the different forms of energy available to meet society’s power demands and were given lectures on solar energy. Students learnt why cleaner forms of energy are vital for long-term environmental sustainability. 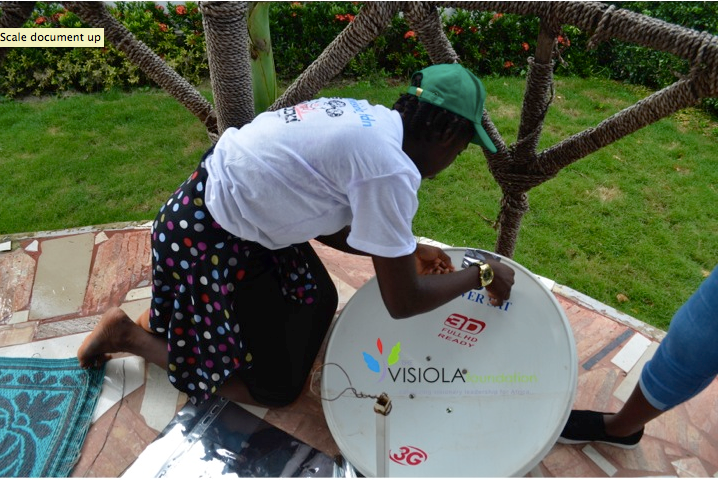 Students also built solar-powered phone chargers, boats and solar ovens. 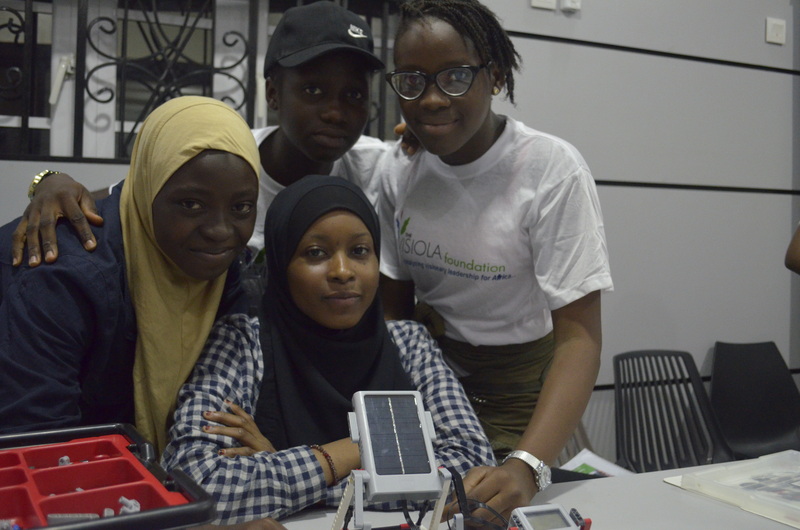 In addition, the summer camp participants learnt robotics and in relation to solar energy built a robotic solar station to explore the transfer, transformation, storage and dissipation of energy from the sun. During these sessions, students built a robotic trash collector and trash sorter. The robot trash collector cleans the environment and picks refuse, while the trash sorter organizes waste into various categories to facilitate reuse, recycling, and disposal. Also, students learnt to build android-based mobile applications, completed daily challenges, and made presentations in order to improve their public speaking skills. The 2018 STEM Summer Camp increased the girls’ competency in conducting scientific investigations and critical thinking/reasoning and increased their confidence and interest in conducting STEM activities. 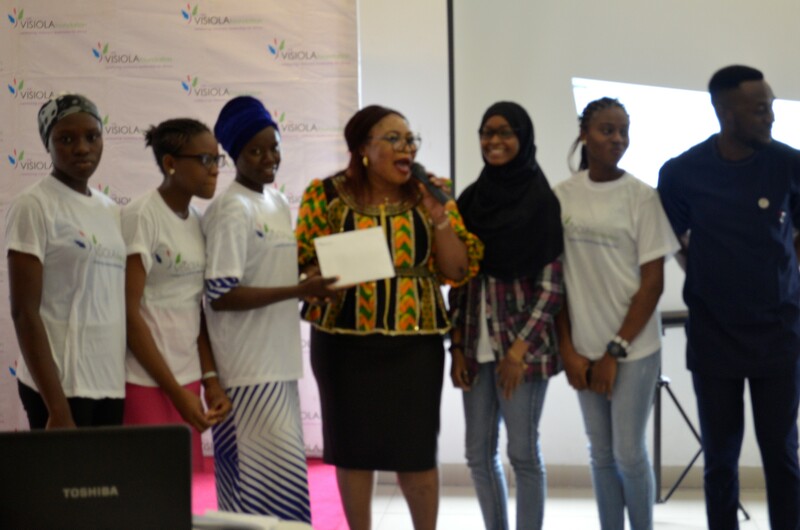 Ms. Tunde-Ajala concluded by presenting the winning team (Team Robotics who built a robotic trash collector and sorter) with a two-day Discovery Tour funded by Schneider Electric. The Discovery Tour will take place in December and will include a visit to Schneider Electric’s factory and office in Lagos, talks with Schneider Electric engineers and IT professionals, career development, including CV preparation and interviewing skills, and finally a visit to the cinema. Here is what some of the camp participants had to say. 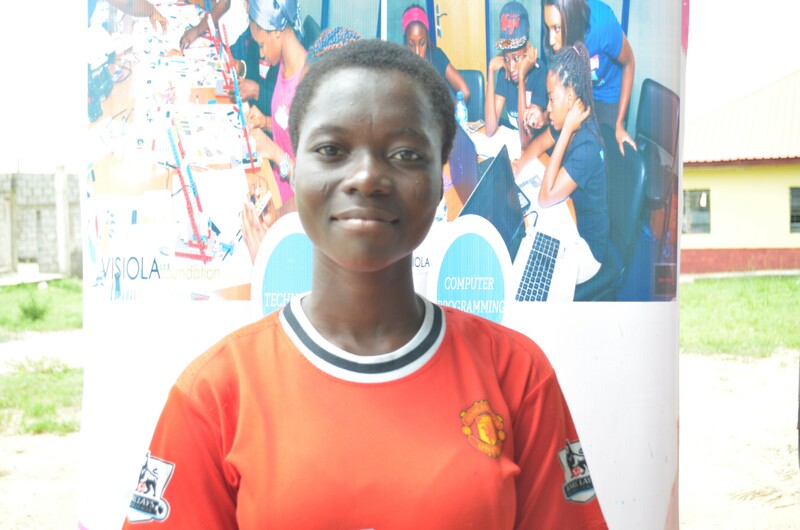 Titilayo (16), an active member of our After-School STEM Clubs for Girls program, participated in the 2017/2018 Science Olympiad and emerged second in the Federal Capital Territory. She shares her experience below. “I was one of 15 science students selected to represent my school in the 2017/2018 Science Olympiad in Abuja. Prior to this competition, I was apprehensive about my performance because my team was selected for the Technovation Challenge Regional Pitch Competition but we didn’t win. I was worried that I wouldn’t win in this competition when I saw students from prestigious private secondary schools in Abuja. I was scared to death that I had come to embarrass myself again. I could vividly remember how I soaked my dress with tears during the previous competition and the fears sent shivers down my spine. However, I remembered the STEM club sessions with Mr. Israel and how he encouraged us to become the best version of ourselves and give everything to excel. I made up my mind to focus and determined to put in my best. Despite numerous challenges during the competition, I was very fortunate and excited to emerge second place during the awards ceremony. I received a silver medal, a certificate of excellence and I was celebrated in my school. I felt on top of the world and now I believe I can achieve much more. My advice to girls is that you should never give up on your dreams. You should not let people determine what you do. Instead, tell yourself that you can do anything you set your hearts to do. Remember, the road to success is never straight so you should be ready to face challenges and also know how to overcome them.